Here on Lake Havasu, it is not uncommon to hear the wails of Common Loons drifting across the water on still mornings, especially as spring migration begins. Just the other day, though, David and I were at Site Six watching the birds feast at the shad run, when we heard an unfamiliar noise. A quiet honk. A distant barking dog? No, it was definitely coming from the water. A Redhead’s quack? After we had heard this sound several times and tried to pinpoint its source, we were convinced that it was being made by the Common and Pacific Loons loafing and fishing together just off Site Six. It was too windy to record the birds, so I resolved to return early the next morning to capture these calls. David and I pulled up before sunrise the next morning (February 14). We weren’t the only ones who thought it best to be at Site Six at dawn on a Thursday morning. We shared the area with a few hundred calling and flying Common Mergansers, a flock of singing Red-winged Blackbirds, and a handful of loons. Boats scooted back and forth on the water, mostly fishermen, leaving loud splashy wakes and occasionally leaving their voices on my recorder. I normally wouldn’t bother recording with so much background noise, but it was a rare opportunity with so many loons gathered in one place, so close to shore. I tracked the loons as they moved around the area and picked up their calls whenever there was a break between boats. At first, the only loons around were Common. The birds remained stubbornly silent while foraging singly. I tracked one bird making its way toward another, and behold, when they finally came together one or both birds made several calls. Again, when a small group of Common Loons loafed together between bouts of fishing, a few calls. I observed this consistently in both species: the calls are nearly always given when two or more birds are close together. This seems to be the “hoot” call described in the Birds of North America account of Common Loon, “used between loons in close proximity and during interactions of low aggression (Evers, David C., James D. Paruk, Judith W. Mcintyre and Jack F. Barr. 2010.)”. A few other examples of this call can be heard here and here. The equivalent call in Pacific Loon seems to be less well-documented. 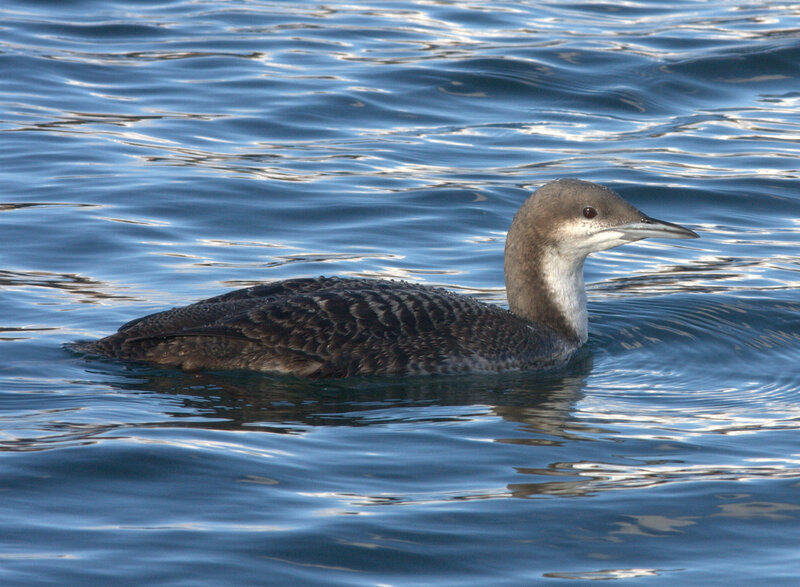 While Pacific Loons are known to give a variety of croaking and growling calls on the breeding grounds, most reports from wintering birds indicate that the species is silent away from nesting areas. The Birds of North America account gives a single example of calling birds in winter, which seems like a different call than the calls given by the Site Six birds (see Russell, Robert W. 2002. in Birds of North America online for details). I managed to get two definite Pacific Loon recordings, here and here. This call is a little lower and huskier than the Common Loon hoot, but the difference wasn’t obvious in the field. When a passing fisherman asked what I was up to, I told him I was recording the short, quiet loon calls. To someone who spends a lot of time up close and personal with these birds, it wasn’t news. For me, listening to these loons calling was a great learning experience practically in my backyard! This entry was posted in Lake Havasu, LCRV, Mohave County, Sound Recordings and tagged Common Loon, Loon calls, Pacific Loon. Bookmark the permalink. Awesome stuff. Definitely never heard anything like that coming out of a Pacific loon! Vurry interesting stuff. More than anything this has just convinced me that another trip to Havasu, now with Loons as the center of attention, is in order. You and David have been killing it lately. Your website is a font of knowledge and, quite possibly, of youth/immortality, but that will take more time to tell.